Spain is emerging as the centre of the battlefield for the survival of the Eurozone as the probability for further fragmentation and exits increases dramatically. The flight of capital from Spain is now bigger than what Indonesia, one of the hardest hit countries during the Asian financial crisis experienced in the late 1990s. On an annualised basis, portfolio and investment outflows from Spain now total more than USD 750 billion, ie, more than 50 percent of the country’s Gross Domestic Product (GDP) as measured by the World Bank. That's more than double the outflows from Indonesia, which reached 23 percent of its GDP at the time of the Asian crisis. Nomura’s Jens Nordvig says Spain’s crisis has entered a “more dangerous phase”, resembling the sort of currency dramas once confined to emerging markets. Net claims on Spain through the European Central Bank (ECB) Target 2 payments system have now reached 39 percent of its GDP. “The build-up in central bank liabilities is explosive,” says Mr Nordvig, Head of Fixed Income Research, Americas, and Global Head of G10 FX Strategy at Nomura Securities. Jorg Asmussen, Germany’s ECB board member has said that sovereign bond purchases are necessary to save the euro and, therefore, within the bank’s mandate. “The risk premia of sovereign bonds now reflect not just the insolvency risk of some countries but an exchange rate risk, which should not theoretically exist in a currency union. The markets are pricing in a break-up of the eurozone. Such systemic doubts are not acceptable,” he said. Who Is Pulling Capital Out of Spain? Spaniards and foreign investors have been pulling money out of Spanish banks faster than ever before as the domestic economy has worsened in recent months. Without the single currency and the flows from the ECB, Spain would already be going through a major currency crisis at this stage. There are plenty of reasons for this flight of capital, including the fact that the Spanish economy is more leveraged than Indonesia’s and Spain's currency union with Europe allows very large capital movements to take place. 2. Outflows from both residents and non-residents. This makes for a rather extreme overall outflow, and one that raises serious concerns about the implications for the Spanish banking sector's ongoing stability and economic growth. Foreigners sold Spanish securities worth 19 percent of GDP over the past quarter alone. Spanish residents caused funds outflow worth 16.7 percent of GDP into foreign bank accounts in the last quarter alone. This situation is clearly unsustainable. The Spanish government has so far resisted asking for a bailout from the European Union and other international creditors such as the IMF, except for the aid already agreed to for its banking sector. France and Germany now want Prime Minister Rajoy to request a full international bailout to prop up Spanish finances and to stop the debt crisis deepening. Do these escalating flights of capital portend the inevitable break-up of the Eurozone? Is the scale of the gap created by the massive flight of capital now so large that anything the ECB might do to put a cap on sovereign bond yields may now prove to be insufficient to bridge the chasm? The cost of the break-up of the Eurozone would be absolutely enormous for the richer north European countries. Why? 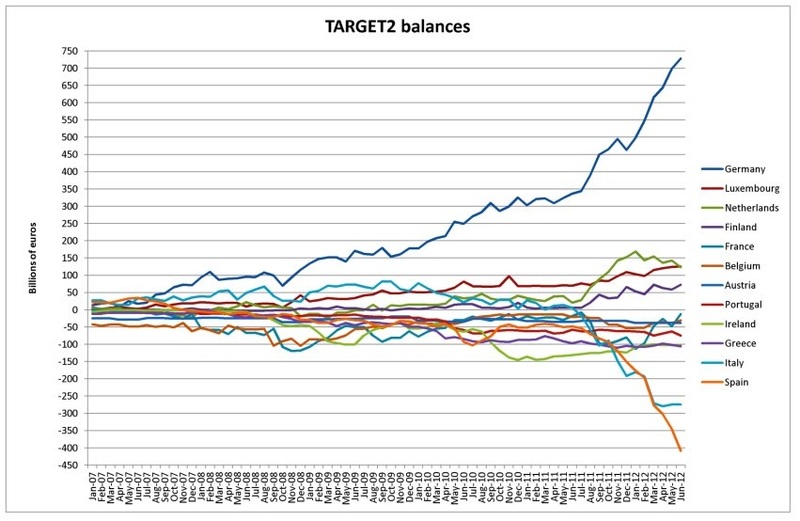 Large positive Target 2 balances have now arisen with the national central banks in the four northern Eurozone rich countries – Germany, the Netherlands, Luxembourg, and Finland – and corresponding big negative balances have now arisen with eight countries – Italy, Spain, Ireland, Greece, France, Portugal, Belgium and Austria. In the event of departure, the rich countries will experience massive black holes or defaults on their central bank balance sheets.